I’ll admit I was in a dangerous mood when I walked into the Goodwill. I was in the mood to buy. In fact, I was determined not to leave the store till I’d ferreted out something to buy. I. Had. To. Buy. Something. 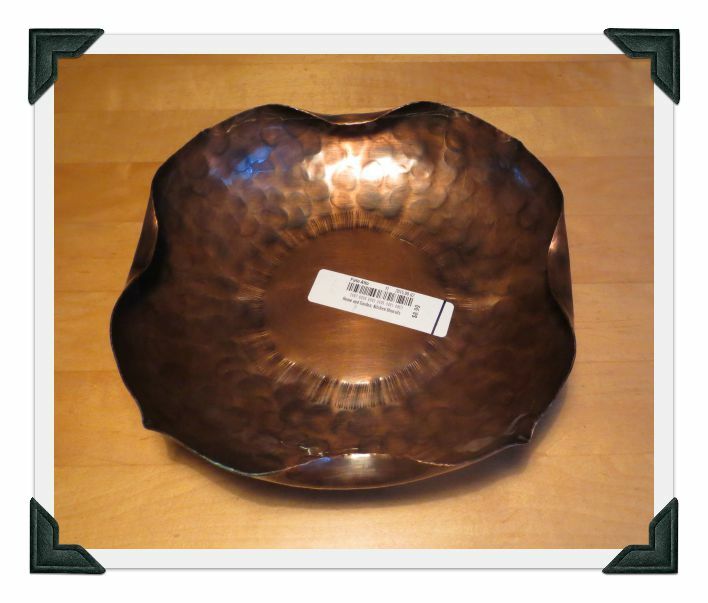 Which led me to Stupid Buy #1…a no-name, generic copper bowl for $8.99. The craftsmanship was a tad crude and unappealing and it had no maker’s marks (not good! ), but still I tried to convince myself “Well, it’s copper and heavy. It must be worth something!” But my gut was telling me this was probably cranked out cheaply for Pier 1 Imports or some such store. Well, I bought it despite my misgivings (stupid, right?) and it turns bowls like this sell for $10 – 15 on Etsy and eBay…as my gut was telling me! Arrrgh, now I have to take it back for an exchange. 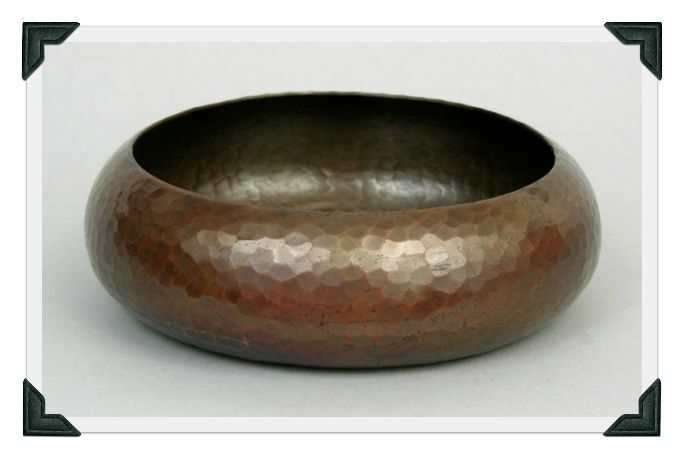 Now, here’s the kind of copper bowl I’d love to find (and own! )…a classy Roycroft (early 1900s). I went to a second Goodwill still in a dangerous mood and succumbed AGAIN! 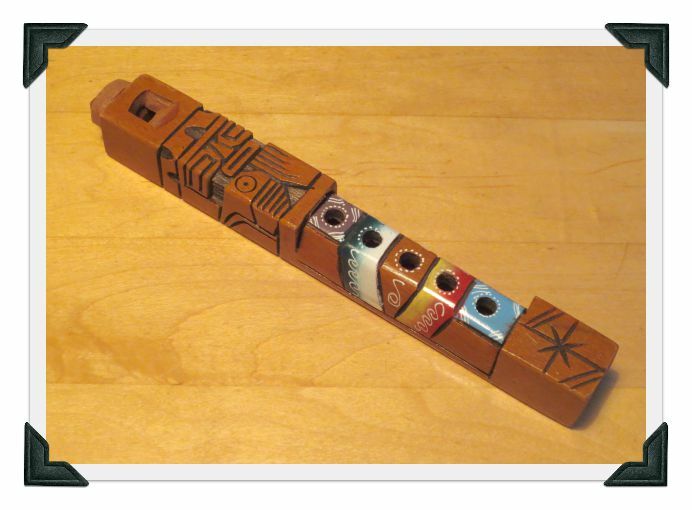 Stupid Buy #2…a carved/painted wooden tribal flute for $8.99. 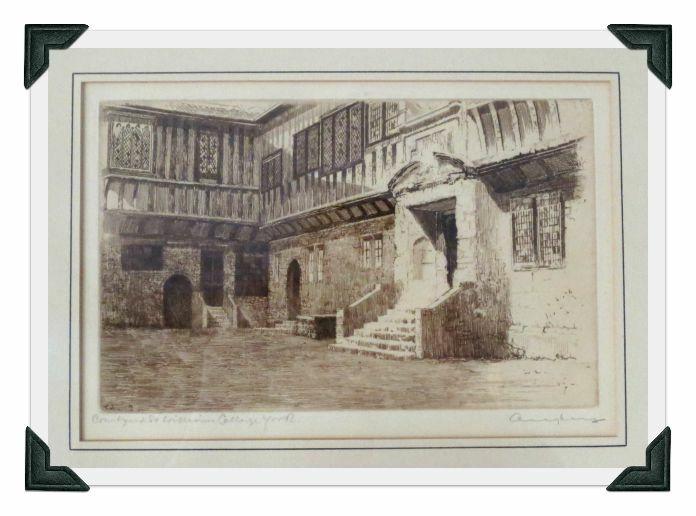 I did find a few good things, like this old, signed etching “Courtyard in St. William’s College, York” by E.J. Maybery. It’s not the most exciting subject matter, but it’s nicely rendered (matted and framed) and on the back there’s a note that reads “Xmas gift from Elizabeth Swallow, Springville, Calif.” Not a long-lost Picasso, but there is a little room for profit and someone will want this! Don’t go out picking in a “dangerous” mood. Be willing to walk away. Any “stupid buys” of your own to share?? It reminds me of “Don’t go food shopping on an empty stomach!” At least it was minimal loss. I bought a Christian Dior men’s tie at the very first estate sale I went to for about $5, but I thought I could re-sell it for at least $20. Turns out eBay is FULL of them! And they’re selling for about what I paid for it. Womp womp, lesson learned! I’m a terrible re-seller. I always buy things that I am interested in, without considering any possible value. I have however looked things up online (ebay, and antique sites etc) on a few things once I got home, and have been quite shocked. I bought an old lace tablecloth for $3.99 online value was $165. If only I could part with it lol. I really love using vintage pieces in my home, and trying to start a little business is going to be rough for me. I don’t know how ya’ll do it with such hreat finds! I have to admit I am sometimes a little sad when something sells…but mostly it’s helped me loosen my grip on things because I realize there are always more and it’s just stuff. But I do have things I won’t sell…favorites and heirlooms that, for now, are sacrosanct! Do you scour thrift stores, yard sales, flea markets and estate sales looking for cool vintage and antique treasures? Me too! 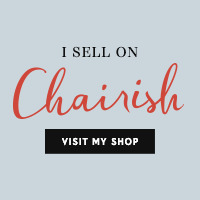 After years of collecting I’ve channeled my passion for vintage things into a small business. In this blog I share a few of my favorite finds and hunting adventures. Would love to hear about your fabulous finds and adventures too. Don’t be a stranger! A Few Finds and a New Venture...Maybe! Thanks for stopping by. Copyright © 2013-2019, huntingforvintage, Karen Ratzlaff. All rights reserved.